Fridays & Saturdays 8pm, Sundays at 2pm. Special performances on Thursday and Sunday nights may be added for private parties and special events. This is a community theater production. Non-Equity. There is no pay. Date and Time: Thursday, May 2nd, 7pm – 11pm, by invitation only. Regular Rehearsal: Starting May 6, 2019, Mondays – Thursdays, 7pm – 10:30pm. Saturdays 11am – 3:30pm, and some Sunday Evenings 6pm – 9:30pm. Final schedule determined by casting. Bring headshot and resume. Please be familiar with the show. At the Open Call – Please prepare 16 bars of a classical musical theater song in the style of the show but not from the show (Jerry Herman songs a plus) – please no Jason Robert Brown or Sondheim songs. Be prepared to present a character and to act with your song. Also be prepared to dance. At the Callbacks – Scene sides will be read, songs from the show will be learned and sung, and a dance callback will be seen. 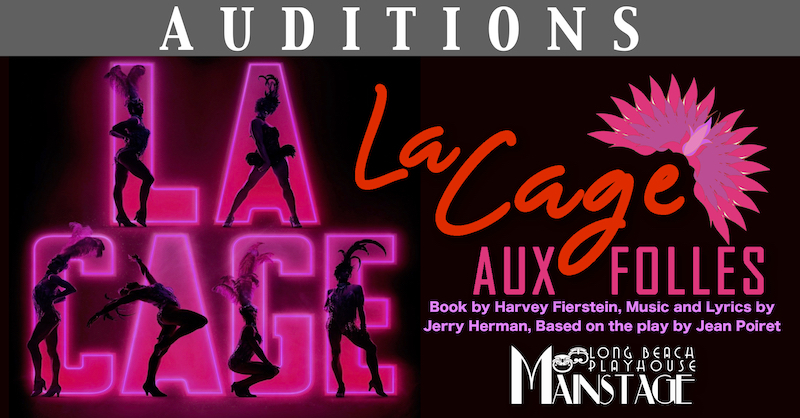 In this much loved musical that inspired The Birdcage, we peer into the living quarters of a famed drag nightclub, La Cage Aux Folles. Two men partnered in love as well as show-biz, Georges and Albin have their self-worth challenged after twenty years of un-wedded bliss when Georges’ son announces his impending marriage to the daughter of a conservative, right-wing politician. Georges reluctantly agrees to masquerade as “normal” to meet the family of the bride-to-be, but Albin has other plans, which escalate with hilarious results! In this charming and incredibly funny musical, we learn that families come in all forms, and that it is all right to be as you are! All Ethnicities are encouraged to audition for any role. -BITELLE (F, 20-40) Vocal Range: Open – A favorite at La Cage. Playful both offstage and on. Will also double the role of COLETTE. -MERCEDES (M, 20-40) Vocal Range: Open – The longest standing member of La Cage. A seasoned performer. Will also double the role of ETIENNE. JOIN OUR FACEBOOK EVENT AND LET US KNOW YOU ARE COMING!